I've been to Las Vegas a few times now. I've done three girls' trips there in the past few years with my friends, and I also went a few times when I was under 21 with my family. One thing that I was surprised by this time around was the weather. It was a cold 60 degrees each day, which is a huge difference from the 90 degree and extremely humid days that St. Louis has been experiencing. Las Vegas was a lot of fun. 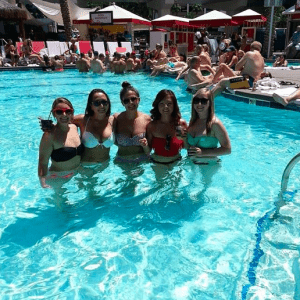 Me and 6 of my friends (and one girl who now lives in Las Vegas met up with us as well) went to Vegas for my bachelorette party. We left at around 11 a.m. on Wednesday and came back at around 6 p.m. on Saturday. 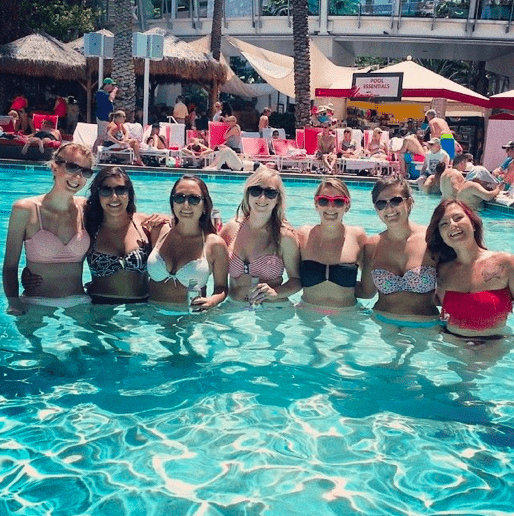 I've gone to Vegas with this same group of friends three times now. It was my sister's first time though, and it was also right after her 21st birthday. She had a blast and I know she's already waiting to go back! New Orleans Recap – Cost and Pictures! Did I work at all? One of my goals on this trip was to put my laptop away and actually enjoy myself on a vacation. I am happy to say that for the most part, I actually did not work. I worked entirely from my cell phone and didn't even bring my laptop. This meant that all I really did was handle urgent emails and make sure that nothing insane would happen while I was gone for 4 days. I don't think I worked much though. I maybe sent out 10 emails while I was gone. It was a little hard to completely separate myself from work, but it was also nice at the same time. 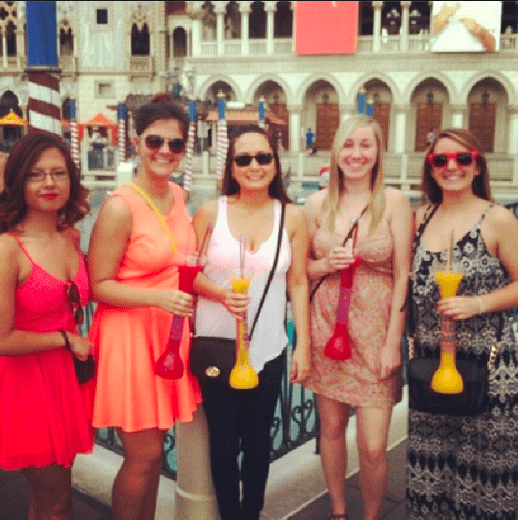 Even though it was my bachelorette party, I'm always looking to save money when on vacation. Why spend money when it takes just minutes to save hundreds of dollars? The total cost for this vacation for me was less than $300. I believe my friends spent right around $500 each, which is a cheap budget vacation for all of us! It was a little more expensive for them because they paid for some of the costs for me (such as hotel and a Vegas show) since it was my bachelorette party – and we have always covered the costs for bachelorettes at past bachelorette parties. However, $500 total for Vegas including airfare, the hotel, food, etc. is not a bad deal! We stayed at the Flamingo. 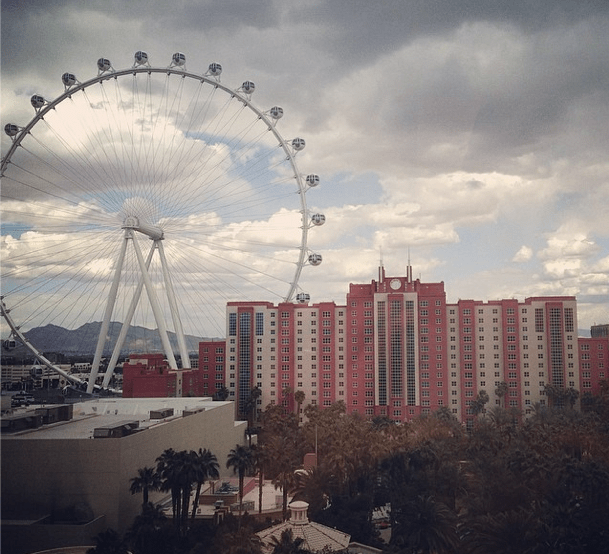 No, it's not one of the most glamorous hotels, but it's right in the middle of The Strip, the rooms are updated, and the pool is one of the best on The Strip. People actually leave their nice hotel pools on The Strip and pay to go to Flamingo's pool, so there must be a reason for that! We had two hotel rooms, since there were 7 of us. The 8th girl lived nearby and went home since she had work during the week. We stayed at the Flamingo in 2012 when we all last went to Vegas, and we loved it last time so we booked it again this time. I believe the total cost was $580 (including all taxes, resort fees, etc.) for all 7 of us in 2 adjoining rooms for 4 days/3 nights. I also brought my Total Rewards card and we were upgraded to a Strip View for free and received early check in for free as well. Even though the hotel wasn't in my name, the super nice worker said that we could use it anyways because they were not strict about that policy. Definitely sign up for your Total Rewards card before you go to Vegas. I believe it saves you 10% at many of the hotel gift shops, it allows you to skip the checkin line at many of the hotels, and you also get to waive the early check in fee (which is $30 per room!). Total for the hotel: $0. It was $580, but since I was the bachelorette my friends would not let me pay. $580 split among the 6 of them though was still a steal! We all live in the St. Louis area, so taking a plane to Las Vegas was our best bet. Luckily, none of us had to pay a lot. I earned enough points through Southwest to get free/cheap airfare for 5 of us. 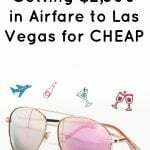 Read How I Plan on Getting $2,500 in Airfare to Las Vegas for CHEAP. Then, one of my friends had buddy passes through Southwest which meant that two of the girls also got to fly for free. Roundtrip airfare from STL to Las Vegas tends to run around $400, and I got it for a very cheap price for all of us. I had around 84,000 rewards points for multiple roundtrip tickets. We also took several taxis for our trip. We took the taxi from the airport to the hotel and back again when we departed. Then, each night we went out and took taxis from there and back so that we wouldn't kill ourselves walking in our heels. The taxis weren't that bad though. I think I spent around $50 in taxis altogether. Total for gas and transportation: $50. I believe they each paid around $150 in transportation though since they all split the cost of the 7th plane ticket. We didn't spend a ton on food when we were in Las Vegas. Since we've all already been so many times, we were a little bit more lazy since we've already tried a lot of the restaurants there. This time, we mainly wanted it to be more relaxing and save time so that we could lay out by the pool each day. We went to Walgreens on the Strip when we first got there. We all stocked up on drinks (and alcohol), snacks, and food (bagels, peanut butter, sandwich stuff, etc.) for the whole trip. This way we didn't need to get breakfast each morning since we would all be too tired anyways. For lunch each day, we ate at the pool. Surprisingly, the pool's food was very good and surprisingly cheaper than we thought. I bought chicken tacos and tater tots (LOL, I know) for $12. For dinner we tried a different place each night. With drinks included, I think I spent around $30 each night on dinner, which isn't bad at all. Drinks were super cheap for us. Luckily all the promoters and clubs want big groups of bachelorette parties, so we were able to get open bar and free tables each night. It's nice to be a girl! We went to Surrender one night, and Tao the next night. The third night we had a free table as well but we decided to roam the Strip, people watch and drink instead. It was a lot of fun! We also went to Thunder From Down Under, which is actually our FOURTH time going. I know, I know, we are a sad bunch of girls 🙂 Since it was my bachelorette party, they all split the cost of my ticket, which was very nice! Total for food, drinks and miscellaneous expenses: $150. This would have been a little higher, but my sister was adamant about paying for some of my meals. Love you Lexy! For the others, they probably spent around $225 each (because of the Thunder From Down Under tickets). What's your next planned trip? What was your cheapest vacation ever? 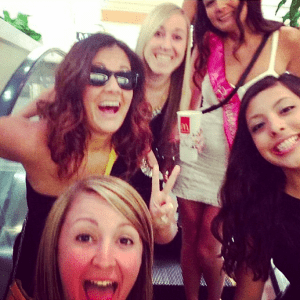 Fun times on the escalator haha. And don't worry, that's wine in my friend's McDonald's cup. We spent a TON of time at the pool. This was taken at the Venetian by my friend Stacie. Another day at the pool! This was our first day when we first got to Vegas. I had a mango drink that was $14. This was our view from the elevator on our floor. The view from our room was Caesar's Palace! 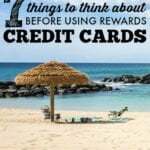 Are Rewards/Bonus Credit Cards Right For You? 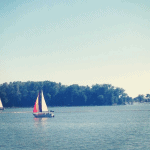 July Goals and Life Update – We're Going On A Cruise! Looks like you had a heap of fun without spending much money at all – Nice one! I’ve never been to Vegas, however I think it looks amazing and it is certainly somewhere that I want to visit one day. Thanks Glen! Do you have any vacations coming up? Looks like you had a great time! The Flamingo is an awesome casino, mainly because it’s in such a great location. The last time I went to Vegas my friend and I played Blackjack there from about 10pm until 4 or 5am. We kept winning so it was a great time, not to mention the free drinks we got while playing 😉 I’m glad you had a good time in Vegas! Sounds like it was awesome and very affordable! I’m glad you didn’t work while you were there, that pool seems too nice to not enjoy. It’s also nice that everyone split the costs evenly; everyone wins in that situation. That’s a great rate for the hotel! Yes, it was so much fun! Our next trip to Las Vegas is this Friday….WOOT! Like you, I paid for flights for four of us using Southwest points. I have the Southwest Companion Pass so Greg was “free.” I hope my trip is as frugal as yours was. We earned four free buffets through myVEGAS rewards and our hotel has free breakfast so we should only have to pay for dinner. Wow that’s awesome that you earned so many free meals! Good job! Thanks for this article! Ideal timing for me as my girlfriends and I are planning a trip to Vegas in July! We are all trying to go as frugally as possible. We booked the cheapest airfare we could find (no points to use or anything though) and got our hotel through groupon! Now we are all playing this facebook Vegas game that should result in some free dinners or shows if we can work up enough points! P.S. Do you know of any salt water hotel pools in Vegas!? I’m allergic to chlorine but I LOVE swimming and it’s going to be JULY! Yes, Vegas is cheap if you are a girl! Under $300 AND you unplugged?! Major props for both. Vegas is on my short list of a fun trip to take, so I’m going to have to come calling for tips. This sounds like so much fun Michelle and it’s awesome that everyone was able to make the trip work while not breaking their piggy banks. And now you have put me in the mood for chicken tacos and tater tots by a pool. Sounds awesome! Haha it was yummy! What’s your next planned vacation? The last time we went to Las Vegas I wanted to stay at the Flamingo, but we ended up at the Excalibur. Now I want to go back, looks like a fun trip! I love Vegas!! It can be done on a budget too. The updated rooms at the Flamingo are great. I love their pool but I’m not so into the party aspect of it. Glad you had a great time, stayed on budget and took a break from work. 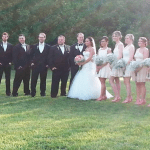 michelle – i know you had an awesome time bc i can tell by your pics! i am going to vegas at the end of next month. i may be hitting you up with a couple of questions. i was just amazed by how expensive the plane tickets were though. for some reason i had always thought it was super cheap to fly there…maybe if you you fly from springfield or peoria, il.. i don’t know, but stl was ridic! oh well, i am just excited to be going for my first time too with my dad and sister for a family reunion. Thanks Lesley! And yes, you can always ask me questions. For the flight, I pretty much had to stalk them for a few months until they were the cheapest price. I think I bought them for around 15,000 or 16,000 points a piece for each roundtrip flight. Looks like you had a really memorable time. My next trip is to Prague again. It is a cheap city to visit in general with the best beer in the world. I can`t help myself but the “thunder from down under” sounds like something you would here from a teenage boys changing rooms. San Francisco sounds like fun! Sounds like an amazing time! I’d love to go to Vegas – a friend wants to go for a bachelorette as well. I’ll have to put your tips to good use! Great pics and it looks like you had so much fun!! I can’t believe your wedding is almost here – very excited for you, Michelle! Looks like you had a great time! 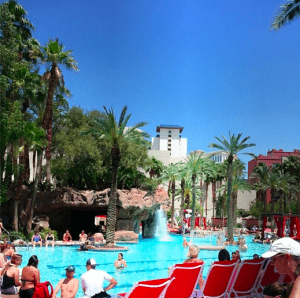 That budget is amazing — not many people can stay in Vegas for that cheap! It helps when you’ve been there before and all the glitter and glam isn’t as impressive. When I first started going my friend and I basically dined out for EVERY meal which is insane. Now we go to dinner maybe once while I’m there. Fun pics! I love Vegas. $300 is a great price for 4 days and 3 nights. My next trip will be to DC. Glad you had a good time and it was frugal too! Not a fan of Vegas myself. I’ll go if someone holds a gun to my head or it’s being paid for by a company and I can eat at all the great restaurants…it does have that! Haha I honestly don’t think I’ll be going back for awhile. I’ve been too many times lately and the only real thing to do there is drink. I’ve never been to Las Vegas, but I’d love to make it out there at least once. 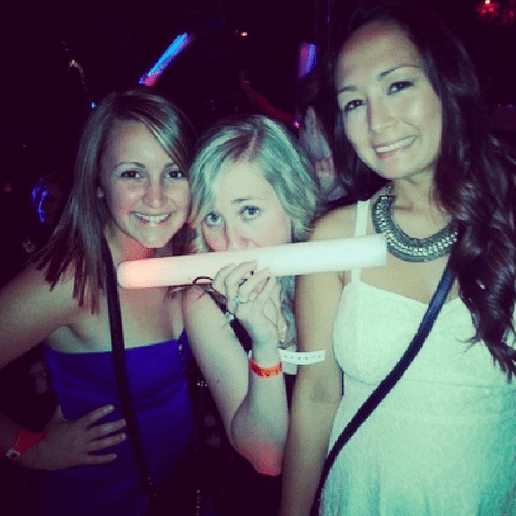 Looks like you had a great time and probably even better than it was your bachelorette party! My cousin had his bachelor party there, but he is 5 years older than me and I was not 21 at the time yet so I missed out on that opportunity. The closest I’ve been to Vegas is going to Atlantic City a few times and while that is fun, it is not quite the same thing. How is Atlantic City? I always see it on TV! 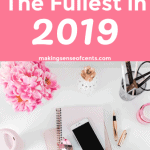 It’s fun, but it’s definitely been down in popularity the past few years – so there is always a lot of great deals and discounts to visit there. Gambling isn’t really my thing though, but one of the newer casino’s called Revel has an awesome night club. I’m more of a beach person and I don’t think the beach at Atlantic City is that great, so I prefer to go elsewhere. But with friends it’s still a fun time. Yeah, we had one cab driver take us the long way, and it made me really mad because I knew what he was doing! The second one didn’t do that though. So crazy, Michelle.. I was actually staying at the Flamingo the same time as you! I was there last Sunday – Thursday. I was there for a work conference, but still had fun. It sounds like you guys had a great time as well. Vegas is always great for a few days to get away and just let loose. Haha that is so funny! I’m surprised we didn’t run into each other. I love this recap! I am going to Vegas for my Bachelorette party in October and I can’t wait! 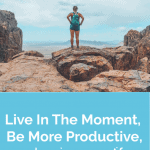 I only live 4 hours away, so that will help me save on travel, but I am definitely going to pay attention to all the tips you’ve given! Thanks so much for sharing!! Looks like you have a lot of fun… I don’t see any pictures from the Habitat for Humanity build ;)?!? Did you know the promoters? I am heading to Vegas in May for a Bachlorette Party and looking for table service, ect. 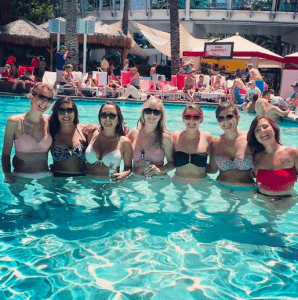 You’ll find tons of promoters when you get there, especially for a bachelorette group. How did you go about getting such great club service? I am planning a bachelorette getaway for my best friend and I would love to get all of us the best deals possible! We are actually looking at the Flamingo as well. 🙂 Was there a fee for the pool if you stayed there? There was no fee for the pool any of the times that we’ve been there.